When we got our hands-on Waldorf's compact hardware synth Rocket last month, we were immediately impressed. Although it might not look like much - packing just a single oscillator, analogue filter and basic controls - we found it to be deceptively powerful, with a great range of sounds available, and all for an exceptionally reasonable price. One of the downsides to the desktop synth, however, was its lack of saveable presets. Fortunately, for iPad owners this is no longer a problem, thanks to Waldorf's new free iOS app Rocket Control. Rocket Control allows users to save, view and edit setting for the synth using their iPad - which connects to the unit via USB and Apple's Camera Connection Kit or MIDI over Wi-Fi. In Waldorf's own words: "This free iOS assistant app for iPad acts as a synth editor for the Rocket and allows users to edit and/or save their patches (when connected via a Camera Connection Kit, WiFi MIDI, or a CoreMIDI-compatible device). Edits can be viewed onscreen or edited directly on the iPad itself. Users can even play the Rocket using the Rocket Control keyboard - plus Pitch and Mod wheels! "What's not to like? Rocket Control is invaluable and free! So do yourself a favour and give your Rocket a sonic boost by heading on over to Apple's App Store and downloading Rocket Control... then reach for the stars!" Rocket Control can be downloaded for free from the App Store. 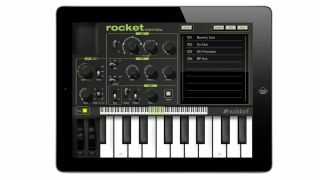 The Rocket synthesizer itself is available at an RRP of €244.00/$349.99.